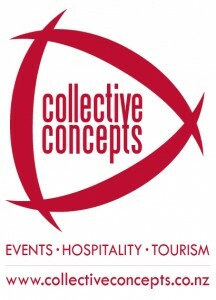 Collective Concepts specialises in the fields of event management, marketing, and development for tourism and hospitality businesses in New Zealand. Collective Concepts understands that no two client’s needs are the same, delivering events, marketing and PR campaigns as individual as your requirements. Bringing imagination to life with their flair for the creative, Collective Concepts can put together a full conceptual solution to suit your requirements, while remaining focused on the important administration aspects to ensure your project runs smoothly. Specialising in creating unique campaigns for a wide range of events, tourism and hospitality businesses, their intimate knowledge of these areas means they know what works and what doesn’t. Collective Concepts innovative solutions will ensure an event or campaign that achieves the desired result and that is to get noticed!